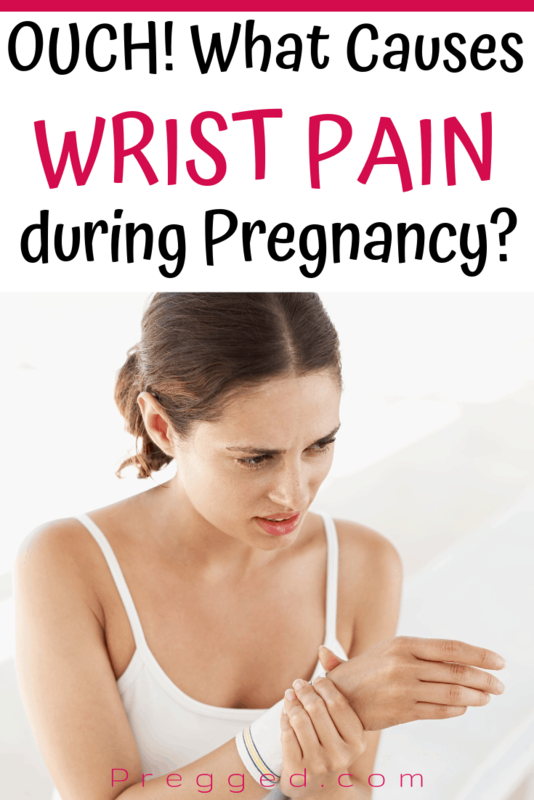 Home » Pregnancy » 3rd Trimester » What Causes Painful Hands and Wrists in Pregnancy? Is pain in your hands or wrists making it hard to do the things you normally would or keeping you awake at night? Pregnancy comes with a huge range of physcial symtpoms and these often include a painful condition of the wrists and hands called Carpal Tunnel Syndrome (CTS for short). This pregnancy symtpom may come as a surprise to you, but it’s pretty common, especially during the second and third trimesters. Carpal Tunnel Syndrome is caused by swelling in the wrists due to a build up of fluid. This swelling in the wrist pushes down on a large nerve which runs up from your hand, called the median nerve and results in tingling, numbness and pain in the wrist, hands, and fingers. It can affect how you grip things and move your hands, making everyday tasks such as cleaning, folding laundry, and vacuuming intensely painful. For some pregnant women, the wrist pain is especially pronounced at night and can interrupt sleep. The bad news is that if you do develop it during one pregnancy, the chances of you experiencing it in another pregnancy are quite high. It can feel like shooting pains, aching, stiffness, numbness. pins and needles, and tingling. You will probably notice the symptoms are worse in your dominant hand, so if you’re right handed, it’s likely to be worse in that hand. You’ll notice the sensations mainly in your middle finger and first finger, as well as the wrist, and it can feel like a constant ache. You may experience more stiffness and pain first thing in the morning, or after you’ve been using your hands a lot. If you’re at all worried about swelling in your wrists and any symptoms you might be experiencing, have a chat with your doctor or midwife to put your mind at rest. CTS isn’t dangerous, but it is uncomfortable, and any advice on how to minimize the discomfort will be welcome. Can I Prevent Carpal Tunnel Syndrome in Pregnancy? There are some preventative measures you can use which may reduce the chances of you developing CTS during your pregnancy. Is Carpal Tunnel Syndrome Serious? There is no risk to your baby from CTS, but it can be painful and very uncomfortable for you. It is possible that the syndrome may continue on after the birth of your baby as the swelling isn’t guaranteed to go down immediately. You should notice that the symptoms disappear sometime during the 12 weeks after your baby has been born. Some people develop CTS outside of pregnancy, and this can be due to a number of risk factors, as well as being linked to the job they do, e.g. typing, manual labor jobs, and even from using a mobile phone for too long – there is a link between excessive selfie taking and CTS! How is Carpal Tunnel Syndrome Treated in Pregnancy? During pregnancy, CTS is mainly treated via conservative measures, e.g. reducing pain and discomfort. After birth the symptoms and condition should disappear by itself, and is unlikley to requie any invasive treatment methods such as surgery. You will probably not have anticipated hand and wrist pain to be a symptom of pregnancy, but such is the joy and wonder of growing a baby within you! The good news is that CTS should go away on its own though some women do experience it alongside breastfeeding. If it the pain doesn’t resolve within a few months postpartum, talk to your doctor about it as there could be an underlying issue causing the pain and discomfort. With the amount of computer work, smartphone use, and other technological methods we use these days, CTS is on the rise. Whilst it might be uncomfortable and cause you sleepless nights be reassured by the fact that your wrist and finger pain will not affect your new bundle of joy.